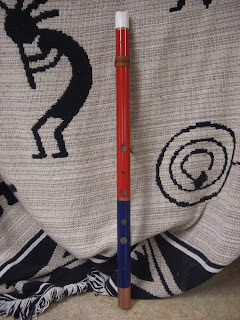 The Namasté flute is made from a 1/2" pvc pipe and is tuned to a Bhairavi raga scale, reputed to be a favorite of the Hindu Lord Shiva. If you have mastered the rim blown technique on a 3/4" pipe, the 1/2" is not too difficult. Very easy to improvise with, and it adds great color to your playing. This flute can be made in a woodtone design or in a combination of desired colors. E-mail for your request.